So, I'm back to my short-lived voyage into the underbelly of metal. 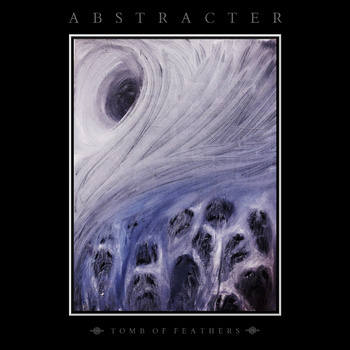 Today, I'm bringing you the three-track "Tomb of Feathers" tape from Oakland, CA's Abstracter. This tape was released around September 2012 and features music that straddles the lines between doom, crust and black metal. This was released by The Path Less Traveled Records. Abstracter have recently shared the stage with fellow noise mongers Children of God. The three tracks contained on Tomb of Feathers are log, twisting beasts. Abstracter build their atmosphere with a lengthy intro sampling rain and thunder similar in vein to what you here on some black metal releases. They also favour majestic instrumental intros, like at the start of opening song Walls That Breathe. When the vocals do kick in, they are cleanly song and more akin to that of doom metal in style to start with, before launching into low, stench ridden growls. That description above is doing Abstracter a bit of an injustice though, as the sound they create is not just heavy but also strangely cleansing. That mixture between doom and black metal works really well, especially with the meaty low end. The distorted guitar is enough to shake the foundations of even the sturdiest of buildings and reduce it to mere rubble. That being said, that impact is not immediate, such is the subtlety and groove of Abstracter's song writing. With To Vomit Crows, Abstracter ratchet up their heaviness to another level. They focus less on clean vocals and more on occult atonal screams and low bellows. Abstracter's ability to weave subtle rock n roll elements and other influences into their music makes it even more endearing. They haven't overdone anything and have managed to keep their integrity. Even the long length of the songs is no issue, due to the craft inside them. The riff at the start of Ash may not sit right with some people due to it's tuning, but it sets the tone perfectly. Those low, dark riffs give way to light in the form of occasional melody and even the vocals, which are more akin to chanting, brings things round. Ash is the lengthiest song on Tomb of Feathers, but it caps of the tape perfectly. It twists and turns through different phases, each with different intricacies yet following a set path. Sometimes music like this can feel improvised and suffers from a lack of focus but not in Abstracter's case. It's clear and mature and thanks to the good production, stands out as a highlight for me. 40 minutes of utter, bestial bliss! Through the above page you can also buy both digital download and physical tape versions of Tomb of Feathers. The Path Less Traveled Records can be found at http://www.thepathlesstraveledrecords.com and at http://www.facebook.com/TPLTR.